Crossville, Inc. recently announced its partnership as the exclusive tile supplier for the new Hotel Design Lab in San Francisco, CA. An innovative collaboration in hospitality design, the Hotel Design Lab is a project of the Newport Beach office of Gensler, the internationally renowned architecture and design firm. Hotel Design Lab features Crossville tile collections throughout vignettes in the 5,000 square foot space. Hotel Design Lab is a collaborative space located in the heart of San Francisco’s design district providing members of the hospitality community a permanent place to gather for learning, networking, and building professional relationships. The lab’s craftsmanship, innovation, and technology put the spotlight on the works of leading designers, manufacturers, and artists through functional hotel vignettes. As the nature of hospitality evolves to include options far beyond traditional hotel environments of decades past, Hotel Design Lab features representations of modern lodging with a focus on designing these spaces for aesthetic appeal and high performance for commercial use. Boutique bath floor – With sandstone-texture and striations, Crossville’s Moonstruck Collection in Juno flows elegantly in the boutique bath perfectly complementing the warm wood tones of the vanity. 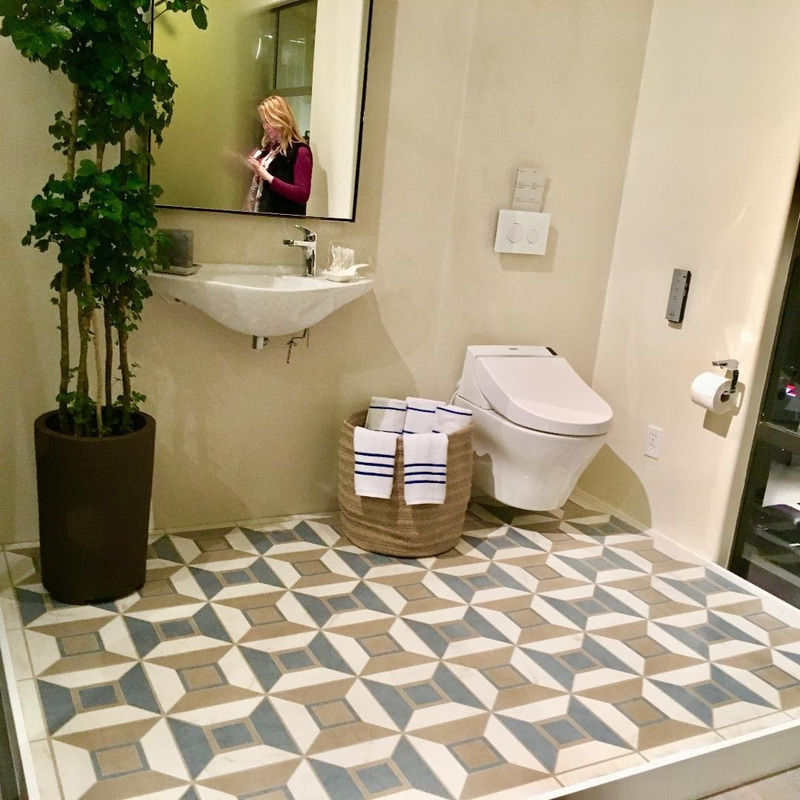 Boutique corner bath floor – Porcelain tile displayed in distinct concrete visuals make a stunning impression with Crossville’s Notorious Collection in Femme Fatale in the corner bath. Sized in the modular 24” x 36”, this urban bath incorporates the modern chic styling of concrete with the top-notch performance specifications that only tile can deliver. Hostel (upstairs bath vignette) – Capturing the look of rich, urban styles, Crossville’s gauged porcelain tile panels in Oxide, Bianco, highlights the walls of the upstairs bath providing a glimmer of weathered metal in the soft white tones in the large format thin gauge tiles. The floors are a custom-designed mosaic pattern featuring Crossville’s Argent and Virtue collections. “Our collaboration in HDL exemplifies our commitment to bold designs and the interior design community. There is no better way to inspire the design community about our product advantages than to showcase them in application,” summarizes Marney. For more information on Hotel Design Lab, visit hoteldesignlaboratory.com. For more information on Crossville products, visit crossvilleinc.com.